A lovely wood cabin on beautiful Vermont pond. Nestled in Vermont's Upper Valley, our cabin overlooks Alton Pond, with an earthen dam, swimming, canoeing and hiking among seventy forested acres. Our cabin sleeps 5 people has a large wooden deck with panoramic water views; a comfortable great room with a living area, newly redesigned kitchen (2019) and large sliding doors that open to the deck and pond; three cozy bedrooms and a simple bathroom with shower. Alton Pond is twenty-five feet at its deepest point, has native large-mouth bass and is stocked with trout. The pond is home to an otter, many ducks, geese, osprey, wood peckers, humming birds and an occasional eagle. On one side of the pond is a football field sized earthen dam, open spaces to play, create and imagine. Maple, pine, hemlock and birch trees bring vibrant fall colors. We are home to abundant wildlife and surrounded by land in the Vermont Land Trust. There are a good number of local adventures nearby, including hiking, tubing and horse back riding. Strafford is located in Orange County, Vermont. Our lovely village has stunning rolling hills, challenging rustic trails and beautiful open landscapes. Sashi and I (Chris) fell in love with Vermont a few years ago when we stayed as guests on a couples farm in nearby Chelsea, VT. Sashi went to college in Hanover, N.H. and my grandfather grew up in Vermont in the early part of the 1900's. After visiting for a couple of summers, we decided to look for "some water and land" and were fortunate enough to find this very special place. We have become very good friends with the previous owner (who we named Alton Pond after) and we love when he comes by and shares stories of the property, pond and the family who originally built the cabin. Sashi practices law and loves the water. She likes to swim the length of the pond and has said she will jump in the water in the December (still waiting for that to happen ;) She likes hiking around the pond in search of mushrooms and all the interesting things to see in the forest. I produce audio and video content MSFocus, a non-profit that helps people with multiple sclerosis. Also, I play taiko drums and am a performing member with a group in Florida (Fushu Daiko) - I practice with Burlington Taiko while in Vermont. I enjoy creating, growing, sharing and learning. Alton Pond is a special place. Being able to share our space is important and an honor. I hope guests who decide to stay or who return, find that being here opens something up inside of them - a creative spark, a new perspective, a renewed connection. The best way I can describe the property - You can feel nature breathing here - Whether it is the constant flow of water, wind going through the trees or birds calling to each other. There is also a good bit of reverence when surrounded by nature. In Japanese culture it is called: shinrin-yoku or "forest bathing" The pond is quite active in the spring, fun in the summer, cool in the fall, and wonderful in the winter. Being a private trout/bass pond, no fishing license is required. We allow for catch and release fishing from May - October. Barbless hooks/tackle only. Shower and toilet are on a well and septic system. We provide soap and shampoo. We are located on a Class3 unpaved (dirt) road in the Vermont country side. GPS is not the most reliable here - we will send instructions on the best way to arrive to our cabin. The town center of Strafford is about 5 miles to our east. We are close to the Sharon and Tunbridge town lines. A spring-fed pond with an earthen dam surrounded by nature. Stocked with rainbow trout and native large-mouth bass. Swimming, canoeing, and paddle boarding are some of our favorite summer activities. Many guests like to go tubing and spend time on the nearby White River and/or Connecticut River in summer months. Phone in cabin and Wifi calling is available. Heater in back bedroom. Floor heated through radiant heater in cellar. Changed every 4 days, if requested. Parking for 2 vehicles is available. High speed WiFi - Shared with other house on property. Wood stove to be started by us or caretaker. Fun open space. Great for chatting, jamming and relaxing. Drip coffee maker. Filters provided. Salt, pepper and olive oil provided. We provide use of an Apple TV. Board and card games are available to use. Yes. It's pretty big and requires a good bit of raking in the fall. We have flat boat canoes/row boat/paddle boards. Must wear life jackets at all times. All children accompanied by capable adult. A large deck and patio for relaxing outside. Skiing at Killington/Pico/Suicide 6 and Stowe. Please ask us for more information. Bed and Breakfast option is available at additional cost. My family had a lovely time at this peaceful & private log cabin on Alton Pond. The cabin is rustic in all the best ways – cozy and comfortable. My sons loved the water trampoline newly installed in the pond as well as all of the other water sports available – paddleboard’s, inner tubes, kayaks, etc. My husband enjoyed the large canoe and catch & release fishing. My little son loved spotting turtles especially the baby ones hiding in the shallows. The owner, Chris, who was next-door was extremely kind and helpful. He led us on a creek walk and invited us to a next door drum ceremony. We enjoyed an outing to Strafford, hiking down to the Old City Falls and visiting the Justin Morrill historic homestead. We also appreciated streaming movies on the smart TV during the one rainy day. The cabin is rather remote on a dirt road. Basic services are a good 15 to 20 minute drive. If you’re looking for nightlife and excitement, this is not the VRBO for you. 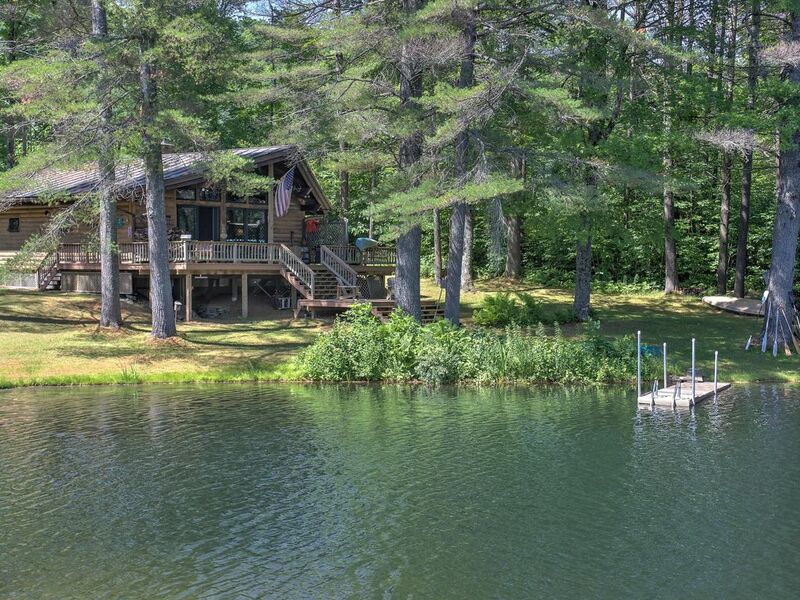 If you value peace, privacy, and pristine nature, You will love the cabin on Alton pond. This is the perfect Vermont get-a-way. Chris is probably the nicest guy on the planet- a gentle and kind host. He told us about local happenings, the pond's history, and shared marshmallows with us! The stars at night are breathtaking, we saw several shooting stars, and the milky way. Location is off a beautiful dirt road, quiet as can be, and the pond is such a lovely feature to look at, swim, canoe or kayak in. I had two teenagers with me and they actually put down their phones to explore the pond! The photos of this cabin are beautiful, but it's so much more so in person. Very large, open living room with deer antler chandeliers, and other 'Vermonty' touches. The couch is large, super comfortable, the deck has plenty of room for outdoor seating. The kitchen is small but very well supplied with olive oil, salt, pepper, cooking spray, etc. which was much appreciated! There's not a whole lot of counter space, and the lighting in the kitchen was meh....but we weren't up there to have a culinary experience so it didn't matter to us. There is a workshop under the house that they use and you can faintly hear voices upstairs while they're in there. No big deal but something to know if you like to sleep all day. My favorite part was drinking coffee and watching the fog roll over the pond in the morning. Next time, I plan to stay an entire week. 4 days wasn't nearly enough! Thank you for sharing this beautiful retreat with us!! Boston, MA, Montreal, QC, Hartford, CT and Albany, NY are all 3 hour drives. In 2018, we blazed a primitive trail around the pond. There are longer hikes nearby and Old City Falls, a great place to go on a hot summer afternoon. In the winter of 2019, we had a good number of trees removed to around the cabin to offer more sunlight during the day and star gazing at night. Please let us know if there are any particular activities you'd like to do and we will do our best to advise you.